When the Four Season Resort Nevis opened in 1991, it surprised me by building what remains the second largest tennis complex at any Four Seasons worldwide: a 10-court, hard, artificial grass, and red-clay facility that wraps around the central plaza of the Sports Pavilion. As at any other Caribbean resort, tennis had to compete with the beach—a battle it will almost always lose between the hours of 11 a.m. and 4 p.m.—and it also shared center stage with a Robert Trent Jones, Jr. golf course laid out on the slopes of the 3,232-foot dormant volcano of Nevis Peak directly behind. Nevertheless, this has emerged as one of the foremost tennis destinations in the Caribbean. A tiny volcanic island, roughly 8 miles in diameter, Nevis lies just across a shallow channel called The Narrows from its sister island of St. Kitts in the Caribbean's Lesser Antilles. The name derives from the Spanish "Nuestra Señora de los Nieves," which means "Our Lady of the Snows," presumably for the white clouds that often shroud the top the Nevis Peak. In the 18th century, its sugarcane plantations generated so much wealth for its then British inhabitants that it came to be known as the "Queen of the Caribees". Old sugarcane mills still dot the landscape, and several of plantation greathouses have been converted to inns. Elsewhere, Georgian stone buildings survive in the capital city of Charlestown and in several of the island's numerous churches, including St. Paul's Anglican Church, shown above, which dates to 1830. Ultimately, though, what I remember most from my visits to Nevis are the warm, genuinely friendly people. And one place to meet them is on the tennis court. Peter Burwash International has managed this tennis facility since the resort opened. 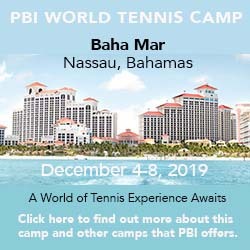 Almost since the beginning, the PBI pros here have sought to involve the hotel's management and staff in tennis, and to encourage local participation, with the quite practical goal of having a diverse stable of players to draw on when guests come looking for matches. Tennis Staff. The latest in this series of PBI pros is David Wilson. 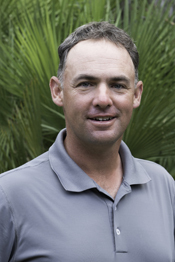 Originally from Melbourne, Australia, David played both the Australasian and European tennis circuit before opting for a coaching career in his hometown of Geelong, Australia. He joined with PBI in 2006 and spent the next 11 years in South Korea as the Tennis Director at the Grand Hyatt Seoul, while also working seasonally at sites at Caneel Bay, Four Seasons Singapore, and here at Nevis. He inherits a well-run program of adult and junior clinics, social mixers, game matching, and private lessons as well as men's round robin that brings together tennis-playing staff, locals, and guests. Courts & Fees. Laid out singly or in pairs, the four hard courts—one with bleachers—two artificial grass courts, and four red-clay courts wrap around the two-story golf-and-tennis clubhouse in an area of the resort known as the "Sports Pavilion," which also encompasses the spa and fitness center. Weathered wooden pavilions at the edge of the courts provide shade, benches, and a supply of chilled water, tropical fruit juice, towels, and scented chilled towels. Five of the courts have lights. Court fees: $50/ hour on hard courts, $55/hour on clay: $5 more on either surface with lights. Beach. Pinney's Beach stretches for four miles along this western coast of Nevis. The section that borders the Four Seasons was substantially renourished—reconfigured, actually—in the aftermath of Hurricane Omar in 2008. The resort created a berm seeded with low grasses and plants to protect the resort from the sea. Four supremely comfortable beach houses, each with a flatscreen TV, iPod dock, room service, and lounge chairs, stand atop the berm and can be rented for the day. Behind them and to the east is an infinity pool and wading pool for families, the open-air Garden Cabana Grill and bar, and the watersports center, which has Hobie cats, kayaks, seaboards, paddleboats, snorkel gear, standup paddleboards and more—non-motorized equipment is complimentary. There is another, quieter pool for adult only at the southern end of the property. Golf Courses. Designed by Robert Trent Jones, Jr., this 18-hole course climbs up and down the lower slopes of the 3,232-foot dormant volcano of Nevis Peak. The 15th is among the most spectacular, requiring a 240-yard carry across a ravine to reach the fairway while green vervet monkeys provide commentary from the adjacent trees, though for stunning views, the 9th hole stands out, a fairway that spills down the mountain slope toward the Caribbean and St. Kitts beyond. Spa & Fitness Center. For tennis players, the Spa and Fitness Center could scarcely have a better location, just off the plaza that borders the courts. The Fitness Center contains an array cardio machines, each with its own TV screen, arrayed along a wall with windows on the tropical foliage and Nevis Peak outside. Behind those machines is a row of LifeFitness stations, supplemented by dumbbells and freeweights. The Spa has a dozen treatment rooms, six of them in tiny cottages with cedar-shake roofs, yellow clapboard siding, and white gingerbread trim. They flow through a courtyard filled with tropical gardens. Guests can use the time before or after treatments to relax in an air-conditioned lounge or sit outside on a covered patio paved with stones or around a plunge pool with views of Nevis Peak or around a second pool with a waterfall. Treatments range from a variety of traditional massages to body wraps, skin-care services, manicures, and pedicures. Room service delivers spa cuisine. And ... The resort also offers scuba diving lessons and boat dives, catamaran snorkel tours, deep-sea fishing excursions, guided kayak tours, and a Laser sailing school. The "Kids for All Seasons" program accepts children ages 3 to 9 for a full-day of supervised recreation, creative and educational activities highlighted by a sea turtle education program that focuses on Nevis's endangered sea turtles. For others, there is an air-conditioned games room with Foosbal, a pool table, various board and video games. The resort has 196 rooms and suites and another 50 luxury villas. The rooms and suites can be found in two-story, shingle-roofed clusters faced in weathered wood and white stucco with latticework trim. In general, they follow the curve of Pinney's Beach behind an expanse of lawn, gardens, and the occasional palm tree. These are spacious accommodations, with off-white tile floors, mahogany furnishings, a subdued but colorful tropical decor. First floor rooms open out onto patios and thus have direct access to the beach; second-floor rooms afford more privacy and have balconies. All are equipped with a variety of creature comforts, including flat-screen televisions, DVD players (a selection of free DVDs to watch is available in the gift shop), coffee makers, complimentary WiFi, and oversize marble baths with soaking tubs and separate walk-in showers. And in a boon to tennis players, each cluster of rooms has a free guest laundry (there's even a package of detergent)—something you rarely find at an upscale resort but one that also partly explains why Four Seasons Nevis is popular with families. The luxury villas range from 1 to 7 bedrooms and feature large living areas, fully equipped kitchens, and expansive balconies and terraces along with private pools or plunge pools. The signature restaurant is the Coral Grill, an oceanfront steakhouse with twin sand-colored chandeliers hanging from its exposed beam ceiling. My favorite, however, is Mango in a former plantation beach club at the northern end of the property. Steps from the water and open to the breeze, it specializes in West Indian-inspired fare like crab and mango salad, Mango's famous glazed ribs, locally caught whole fried snapper or a Caribbean roti, washed down with, say, a Mangojito made with the local Brinley mango rum. In addition, there is Neve, for a buffet breakfast or casual Italian dinner, and the open-air Cabana near the beach and pool for light fare during the day. Finally, Kastawey Beach Bar, located at the southern end of the property, serves up creative rum cocktails and light bites featuring locally sourced ingredients from land and sea. As an alternative, you can catch a cab to dine at Montpelier Plantation or the Golden Rock Inn, or stroll up the beach to celebrity favorite Sunshine's (don't miss their Killer Bees, a rum drink), Chevy's, or the Double Deuce. The resort has 196 rooms and suites in gingerbread-trimmed cottages, which variously have golf course or ocean views, and an additional 50 luxury villas. Minimum stays may apply at certain time of the year. Rates vary seasonally so check the website for the dates you're interested in traveling. Travel Instructions. There is a small airport at the north end of Nevis served by turbo-prop planes and other small aircraft from Caribbean hubs including San Juan, Puerto Rico, Antigua and St. Martin. The alternative is to fly to the nearby island of St. Kitts, which has with direct flights from Miami, Charlotte, Atlanta, New York, Newark, Toronto and London. The Four Seasons staff provide transport from the airport by private taxi and boat directly to the resort pier..
General Tourist Information. For information about Nevis, check out the Nevis Tourism Authority website or phone 866-55 NEVIS.